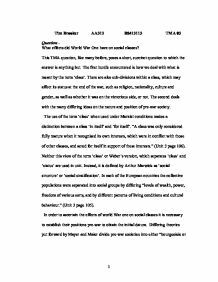 What effects did World War One have on social classes? 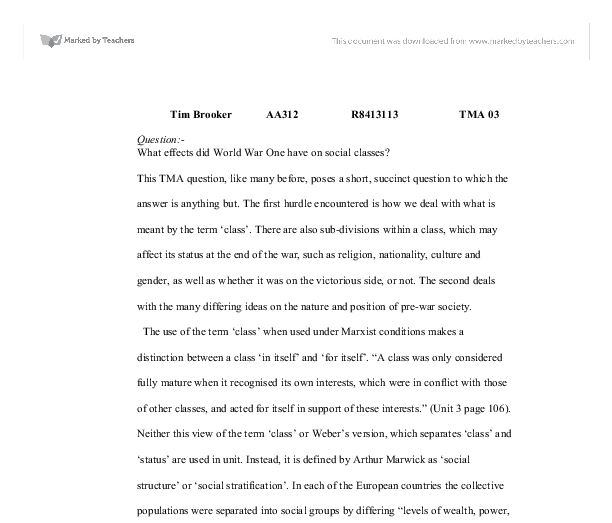 Tim Brooker AA312 R8413113 TMA 03 Question:- What effects did World War One have on social classes? This TMA question, like many before, poses a short, succinct question to which the answer is anything but. The first hurdle encountered is how we deal with what is meant by the term 'class'. There are also sub-divisions within a class, which may affect its status at the end of the war, such as religion, nationality, culture and gender, as well as whether it was on the victorious side, or not. The second deals with the many differing ideas on the nature and position of pre-war society. The use of the term 'class' when used under Marxist conditions makes a distinction between a class 'in itself' and 'for itself'. "A class was only considered fully mature when it recognised its own interests, which were in conflict with those of other classes, and acted for itself in support of these interests." (Unit 3 page 106). Neither this view of the term 'class' or Weber's version, which separates 'class' and 'status' are used in unit. Instead, it is defined by Arthur Marwick as 'social structure' or 'social stratification'. In each of the European countries the collective populations were separated into social groups by differing "levels of wealth, power, freedom of various sorts, and by different patterns of living conditions and cultural behaviour." (Unit 3 page 105). In order to ascertain the effects of world War one on social classes it is necessary to establish their positions pre-war to obtain the initial datum. ...read more. There would also be less acceptable suitors to court the daughters of these families, and continue the line. These factors would inevitably combine to form the plutocracy mentioned in the unit. This ' watering down' of the aristocratic classes came about mostly by marriage. The heirs from the 'new money', upper middle class, whose families, through industrialisation and wartime manufacturing had made vast fortunes became upwardly mobile, - the first 'yuppies'. They began to intermix with the upper classes until they had infiltrated to such an extent that they became a new 'lower upper class', without the family lineage or great tracts of land, but with money and eligible bachelors. At the peak of the aristocratic class, and therefore all classes, are the royalty. Their position at the end of the war was pivotal upon whether they were on the side of the victors or the vanquished. Many of the European kings lost everything purely because they countries were aligned with Germany's cause. Of the victors, Russia's tsar stands out as being on the victorious side but still losing all due to the countries revolution. Along with the loss of the tsar the whole of the Russian aristocracy was either killed or forced into exile, and its lands divided up and given to the proletariat. The Russian aristocracy were not the only members of their class to see their lands either eroded or disappear, as the formation of new states in Europe at the end of the war and the movement of borders caused many of ...read more. This transformation inevitable due to the nature of capitalism, was accelerated due to World War One, although those members of the Tim Brooker AA312 R8413113 TMA 03 aristocracy who retained most of their land and money managed, on the whole, to retain their power base, the war being a short, to medium term 'blip' in their fortunes. Eastern Europe saw larger post-war changes for both the upper and lower classes, but these were due more to the restructuring geographically of the region than reform. Russia was still in revolutionary turmoil at the end of the war, all members of all the classes were paying the price of revolution. As we have seen the effects of World War One on social classes varied due to many different factors. Generally the upper classes did not come out of the war as well as the lower classes, however, because the fundamental basic structures of society remained in place they were able to recover their positions of power. In post war industrialised Europe the upper classes would never enjoy the same extent of power over the middle and working classes though, as their importance and power had become recognised due to the 'total' nature of the war and would continue as the seeds of the 'mass society' had been sown. BIBLIOGROPHY Open University, AA312 Total War and Social Change: Europe 1914-1955, Primary Sources 1: World War 1. Book 1 Europe in 1914. Book 2 The Impact Of World War 1. Europe 1880-1945 J.M. Roberts ?? ?? ?? ?? 1 ...read more. Marx's argument is that society is really all about economics - who gets what and when. How economic reward influences access to political power and social status, so there are groups within society and these groups he calls classes, working, middle and upper. work they carried out in cotton production, they were employed in the mill for long hours. Charles Dickens comments on working class life in Hard Times, a secondary source, a theme found throughout Hard Times is that managers, such as Bounderby, live in the lap of luxury at the expense of the workers. The most important means was to bring order into the conduct of its adherents. Hence we have methodically rationalized ethical conduct. The Calvinistic doctrine of predestination was only one of several possible motives which could have supported the methodical rationalization of life. Work generated income, which in turn provided them with the resources to live. There was however, as aforementioned, a parity of low wages, which often propelled the people to endure even longer working hours in their desperate attempts to make a living for themselves and their family. in general and the impact of this change on the role of class differentiation in particular. Two notable thinkers are Marx and Durkheim. Marx asserted that class conflict is the prime force generating historical change; and Durkheim stated that occupational differentiation lessened consensus within society and hence altered the nature of social solidarity.